We hope you had a wonderful Thanksgiving! If it was anything like mine, it featured at least four different kinds of carb-loaded dishes, and you are looking forward to the new Smith Center for Recreational Sports opening in January like I am. The old standard of “within 24 hours” still applies, but the electronic age and the pace at which hiring decisions can be made are pushing that to “within 12 hours.” You don’t need to send it from your phone in the parking lot after the interview, but later that day, that evening, or early the next day are best if sending by e-mail. If planning to send a hand-written card, put it in the mail no later than the next day. Either is usually fine. However, if you know the interview process will proceed rapidly (e.g. the interview is a Thursday and they will follow up with candidates on Monday), then definitely send an e-mail so that your thank you note is included as part of their decision making process. It shouldn’t be the next great novel, but it also should be longer than just a sentence or two. 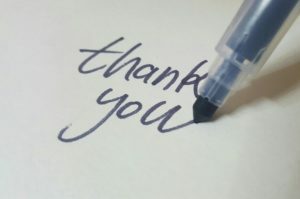 Rather than simply the basic “Thank you for meeting with me…I enjoyed learning about your organization…I look forward to hearing from you…” try to add some details from your background that remind them of how great you are, or follow up on a question you weren’t quite sure of and needed to research further. If sending by e-mail, 1-3 short paragraphs will be sufficient. If writing by hand, 3-5 sentences will be fine as long as you include something that connects the card to you as a candidate (see links below). While I know that “everyone you talked to” is not always practical, it really is your goal. E-mail makes it easy to send a personalized thank-you note to every member of the search committee individually. It’s best if you can provide slightly different information that will be interesting/relevant to each person (e.g. the interviewer from Human Resources may care about one of your past jobs while your director might find your education more important). To make it more management when interviewing with multiple panels throughout the day, you could potentially send one e-mail to each group of interviewers you met with. YES! Any time you speak with someone who is evaluating you as a candidate or could influence your chances of being hired, thanking them is a polite and professional courtesy. This is a highly American custom, but can be critical to your success. Employers have indicated in general that only 20% of candidates follow up, so it definitely helps you stand out in a positive way. As I mentioned in this September 14th post, it is important to continue following up periodically over the weeks and months after the interview. If you haven’t already followed up with the folks you met at the Fall Career Expo and other recruiting events in September, now would be a good time to check in with them. Do you have any success stories that relate to sending thank you notes and/or following up after an interview or recruiting event? Please share them in the comments below!